Red Sox Insider. Who is it? Don’t know. Someone in the Red Sox front office. It’s not Rob Crawford, the new VP of Red Sox Nation, and it’s not Big Pupi. You can probably rule out Curt Schilling, because he has his own blog at 38pitches, and also Kevin Youkilis, who closed up shop at Youuuuuukkkkk during this season. It’s not Wally, because he stopped posting during the 2006 pennant races. Could it be as high as a John Henry or a Theo Epstein? What about Bill James or Manny or someone in ticketing or on the grounds crew? No idea. I have the admin capability to see the email address and IP address for its creation, and that was not revealing enough to narrow down an identity. It’s known within the club already, too, and not only still there, but now promoted on redsox.com. So it’s the real deal, only with a mystery element. And by the way, it’s also a great first post. Considering the many hundreds of Red Sox MLBloggers around here, such as The Boston Red Sox Blog or Brownie Points, this should be interesting. Let the mystery begin because it just launched, and comments are turned on. Who is the Red Sox Insider? Have fun. Just saw the latest example of MLBloggers getting MLB.com bylines. Thanks to Steve Dempsey, Paul Festa and Ryan Maloney, who actually have a triple byline AND their own taglines. I have never seen that kind of crediting at MLB.com before. The taglines link to their own MLBlogs. Millions of users currently are seeing the display of our Video Games technology package now displayed on the homepage as I write this. See my previous post as well — I had lots of candidates to review the Dodgers/Dbacks stuff but at last check no Dodger/Dback fans among them. Would prefer people with those rooting interests, if not in next 24 hours will just send the DVD sets out to best available bloggers. Must have an MLBlog. Service Advisory, updated 6:48 a.m. ET Wednesday: All pages rebuilt overnight, should see improvement in performance. Welcome to rookies and thanks to the entire community, which has created as many blogs this month as we did in the first three years. Seems you all like FREE blogs and being able to legally show your favorite team’s logos and stuff. Welcome to Digging In The Dirt. Welcome to Three Rivers, Five Titles, One Blog. Welcome to Zajack’s Column. Welcome to No Steroids Here. Welcome to The Bronx Bomb. Welcome to GoldGloveLuie. Welcome to 26 and Counting. Welcome to Mike Acker. Welcome to bleacherbum. Welcome to Brewing a Winner. Welcome to Mr. Mets Daily. Welcome to Meksquesttogotoagame. Welcome to playing like a girl. Welcome to Cardsfan18. Welcome to Smoke Signals. Welcome to the official MLBlog of the Houston Astros’ front office, where you will find out whether the roof will be open or closed for each game. Welcome, free-world bloggers! If you have a new blog, don’t be bashful, throw it in the comments here with your URL! Everyone leave a welcome comment for them! development, Draft prospects and things important to all organizations. The Rangers are inviting their fans to congratulate Eric Nadel, on the 30th year of his broadcasting the club’s games. That’s a lot of baseball from the catbird’s seat, and we salute him here at MLBlogs as well. Personally, I used to cover the Dallas Mavericks (1986-90) for the Fort Worth Star-Telegram and had a weekly NBA radio show on KRLD, and there were nights when Nolan Ryan was throwing and I would follow the action with Eric. If a no-hitter was alive through six, I would drive one mile away and jump into the park with everyone else. Just in case you saw Nolan make some more history. There are a lot of fine pitcher blogs out there, from Curt Schilling to Pat Neshek to Phil Hughes to Kevin Slowey. But no Major League pitcher, probably no other athlete, throws better bloggage than Rangers reliever CJ Wilson. It’s like he invented what blogging should be like for pro athletes. No one else involved. Create a blog, post, live it, read the comments and interact. Can you imagine if Babe Ruth had a blog while he was on the road? Posting at stops along the train ride to Philly or St. Louis or Chicago? What if Babe had blogged about his Called Shot? Filter out the storytellers completely, just say it on your blog to the people. That’s CJ’s world, unchained. Neshek gets a close second by making his a cottage industry. I started this blog a couple of weeks ago on a different site. But obviously I wanted a bit more exposure so I have moved all of my older entries into here. From now on I will be updating regularly on MLBlogs.com so thanks for checking it out. Feedback whether it be positive or negative is always welcomed. Be sure to drop him a welcome comment and leave your URL so people can find you. Our friend and longtime astrosdehouston.com blogger Rafael Rojas Cremonesi reports from Venezuela that the new Movable Type software is a friendly step forward for Spanish-language MLBloggers. “I love the fact you can set up your MLBlogs platform to have instructions and commands in Spanish,” Rafael emailed. 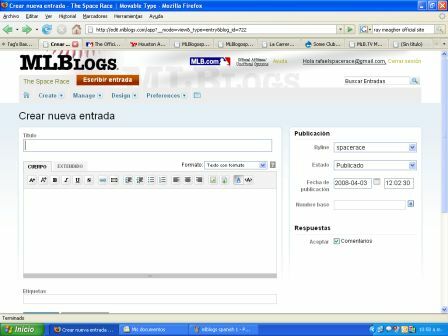 “The whole interface for blogging, posting and whatnot can be set to be read in Spanish. So instead of seeing ‘post’, ‘create” or ‘edit’, you can see ‘crear’, ‘editar’, etc. There are certain menus that would not change its language, so maybe that could be checked out.” Will do and thanks, Rafael. Dan/Steve/Zack/Beth et al: Thanks for the help in the comments on these updates. Nice when fellow bloggers are helping each other through the trials and tribulations of learning an entirely new software environment all around Opening Day. Please continue to post your questions/comments/gripes/whatever here as we continue to work on any relaunch bug issues as well as scheduled upgrades for the next phase of updates coming soon. They customized MT for you all and it works best if all of your feedback is continually added here so it can be incorporated into the Google Doc citing next needs. Thanks also for your patience with me last weekend as I was Bernie Carbo-loading and then pounding pavement Sunday at the St. Louis Marathon and recovering Monday. It was a perfect day that took you toward the Arch at sunrise then past Busch and down around the A-B brewery then back up past the Purina plant, through Forest Park (and the outdoor Muni), Wash U, Clayton, Delmar’s killer hill, U-City and then eventually back toward the finish near Union Station. I know that this crowd would have wanted me to go from the finish line straight over to the simultaneous first pitch of Nationals vs. Cardinals a few blocks away to watch and blog, but my legs wanted nothing to do with that. Now my left Achilles tendon gets a vacation as I surf the Sphere. Our friend Chris does a great job of updating one of the best Giants blogs. So far so good on the comment moderation question of what happens when you break down the pay wall. Just checked and one person the past week reported an offensive comment (removed). Those flags are prominent after every comment you see on MLBlog. If you see something, say something, as they say around NYC. 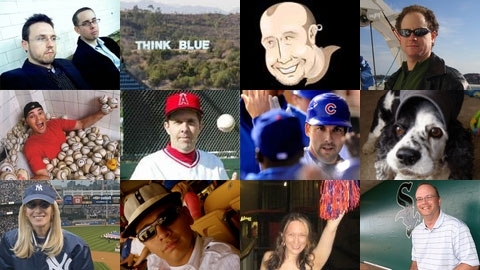 You are your own MLBlog’s moderator, but we try to help keep it like a ballpark atmosphere. Is it just us, or does every Phillies blog ever created have the “ph” consonant as a play on words in the title? Is the Phillie Phanatic naming all of these? Would you guys have started up phacebook instead? (No sooner did we write this than Philsfirst came to the rescue with the letter “F”.) And memo to our new friend Jenn at Phillies Phollowers who commented on this post, we would consider that one except it will be too dated so think in terms of lightning-fast baseball schedules as yesterday’s history and someone will be reading that excerpt tomorrow morning.